IWM rose by 2.2% this week, while my account rose 0.2%. The loss-floor has fallen to -6.5%. US markets were closed for Good Friday. URTY: The stop price dropped sharply (to -2.8%) right after I bought this, then rose back to -2.2% for Thursday. That seems to happen rather often with these trades, although I haven’t done the research to characterize the issue. Hopefully the market will continue to rise and so will my stop price. The robot worked properly this week. All trades went through on time. SRTY ⁰: Skipped this trade due to last week’s memory-limit problem with the robot. Would have been a winner. 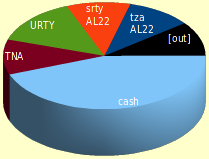 TZA: As has been usual for TZA trades since August 2011, this one barely made any profit. But I didn’t lose, even though I was “fighting the Fed“! SRTY ¹: Another loser trade. Too bad I skipped two winners in a row. URTY, TNA: So far, so good! ATML: There is a “Buy” order for Monday.